For Japanese, it’s not a common practice because used items are considered unsightly, and many people feel embarrassed to be looking through what feels like garbage. 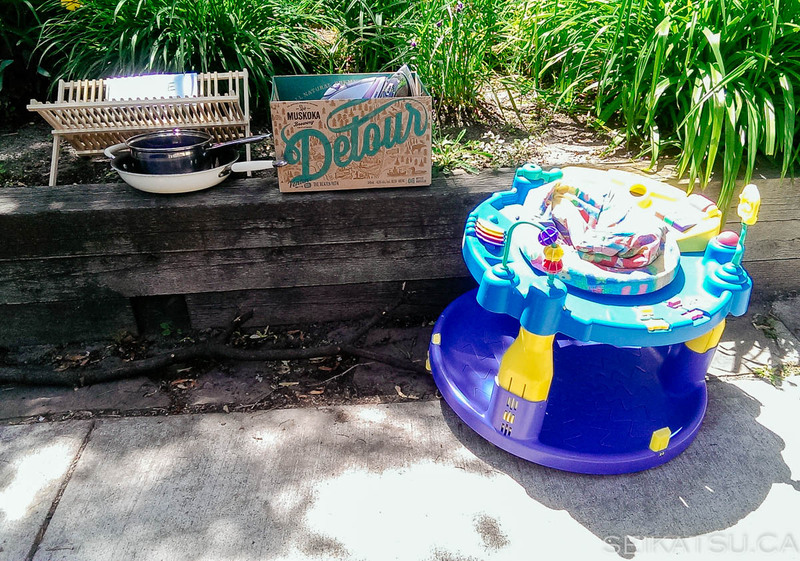 We decided to do an experiment, take a walk around the neighbourhood near Chester station on a summer Saturday, photograph all the free items, and maybe walk away with a few things too. Here’s what we discovered. Our first find was actually the best of the day. The picture doesn’t show it clearly, but there’s a piece of paper with the words “Free” on the wooden dish rack. 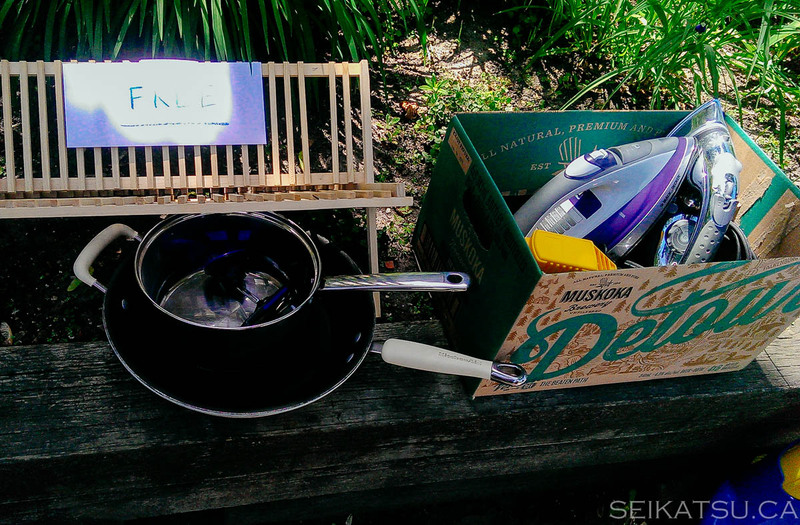 The house owners left a stainless steel pot, a large non-stick wok, two irons, and baby saucer. You can have a closer look at the items at the top post image. Everything is in excellent condition, and we decided to keep the steel pot and one iron. It should also be noted that baby items are commonly left out on curbs because some items have expiry dates, and many baby items can’t be resold in thrift stores. 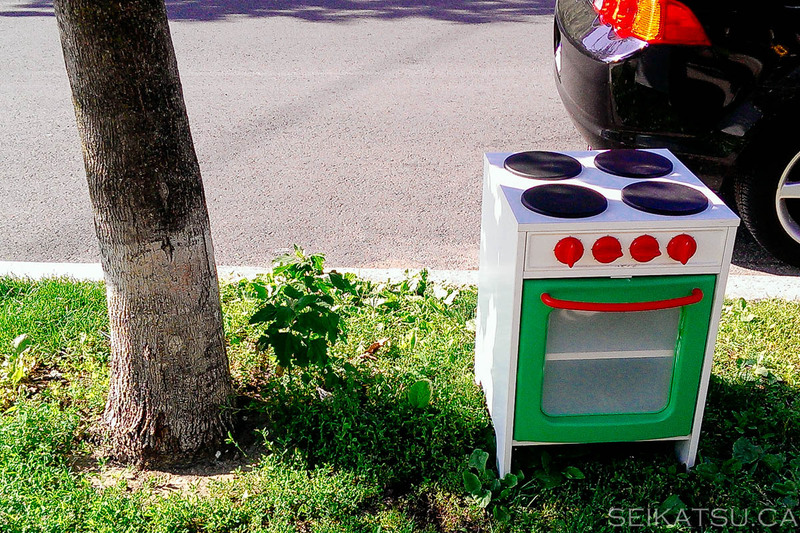 After walking a little more, we came upon a cute wooden stove for children. Just a few house over, two neighbours were leaving out a lot of stuff. 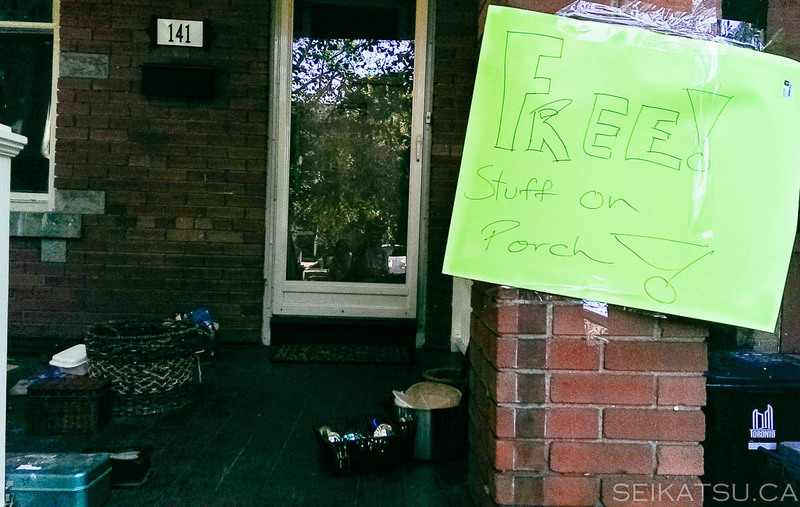 In fact, one person put everything on his/her porch and left a sign to grab anything. The porch had a lot of junk – Christmas ornaments, boxes, tools, baskets, a metal bed frame, and hardware. 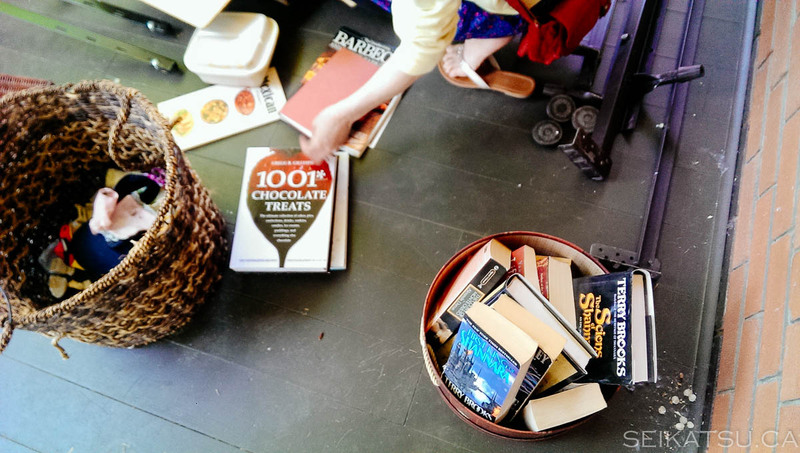 However, the owner also left out many beautiful cooking books. We took a few books because the cake pictures inside were gorgeous. We left the chocolate books out for other people, mostly because we couldn’t take anything more due to the weight of what we were carrying already! Just next door, their neighbour left out quite a number of items on a bookshelf (also free), but we could see many items were already taken. 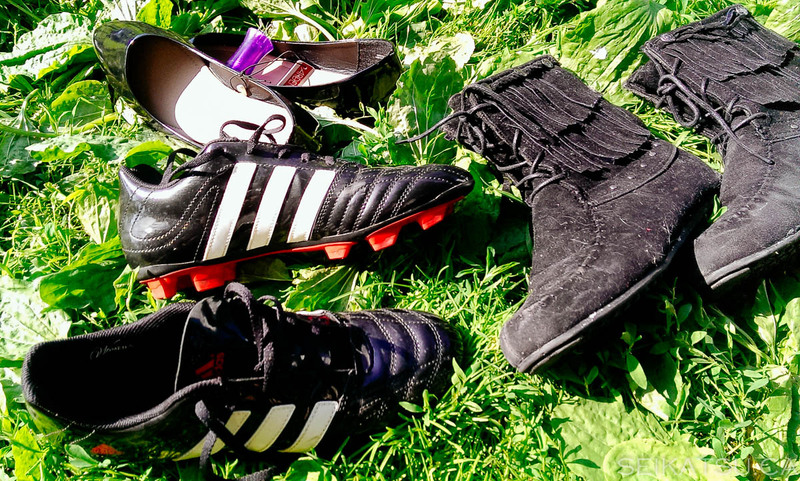 We did find a number of large women’s boots left out on the grass, including a size 9 women (Japan size 25) Adidas soccer cleats in excellent condition. It probably fits many men too! 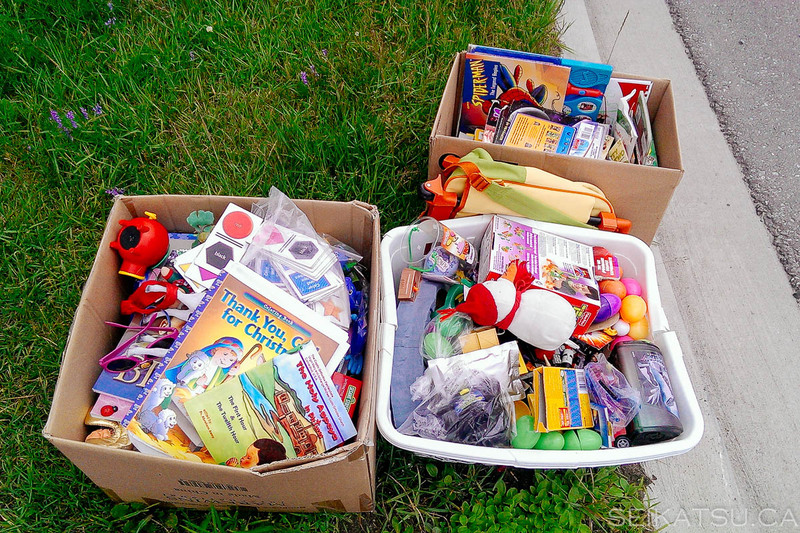 Later in our walk, we found several baskets with children’s books, stationary, cheap toys, and dollar store items. A few things were broken, but some toy cars were still in their packaging. We encountered a number of other random items – have a look at the bottom gallery to see what we found. On a side note, one of our writers also found a perfectly working computer monitor on another walk, and we’ve also attached it in the gallery. 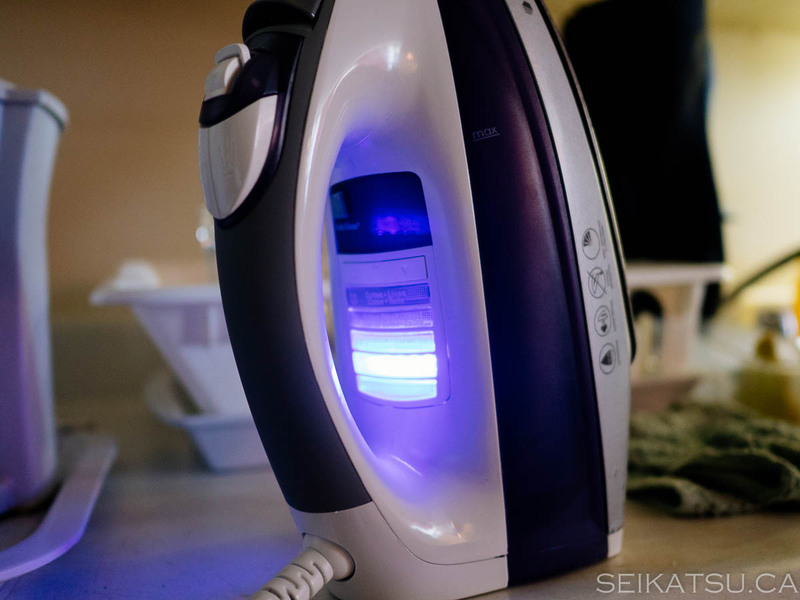 Back at home, we tested the iron – it works great and looks like a really new model too! 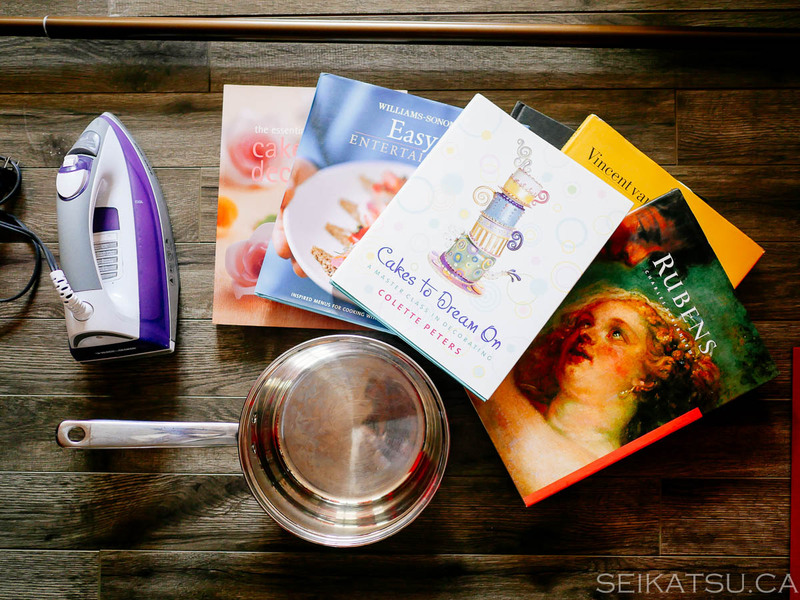 We also found the pot to be of very high quality, and cake books were really fun to read. Also shown are a few art books we picked up at another location. We definitely will be doing this more and sharing what we find. Here are some tips, in the meantime. It has to be on the curb, right by the road, not the lawn, since many Canadians leave their children’s toys out on the lawn. Usually, there will be a sign “Free” written down, but not always. People leave things out for free all year round, but the best time to get the most items is in late spring, when people do their “spring cleaning” or the summer. Usually the weekends are better, but that’s also when lots of junk collectors drive around the neighbourhoods and take everything. On weekdays, you might have a better chance at finding high quality items. 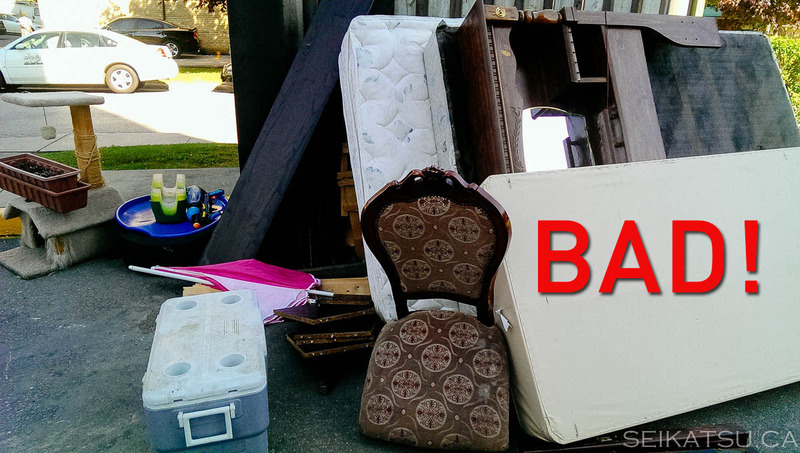 DO NOT take mattresses, sofa or any fabric chairs, as mattresses usually have bed bugs, and sofas have pet stains. If you take a table or chair, make sure you spray it all over with rubbing alcohol (get this at the dollar store) to kill off any potential bed bugs.